Like Scrubs? Grey’s Anatomy? House? Then you’ll love this. 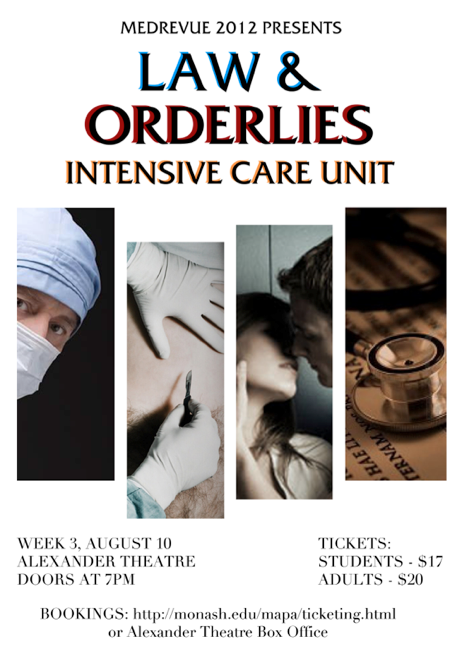 MUMUS is proud to present its 2012 Med Revue production, “Law & Orderlies: Intensive Care Unit”. Written, directed, produced and performed by Monash’s very own medical students, it’s pretty clear that the Alexander Theatre is the place to be on Friday August 10. Join us in following our cast as they face the many challenges of creating a hit medical drama. Groove with our choir and house band. Watch our dancers take on Michael Jackson, one zombie at a time. Marvel at just how damn talented and good-looking that guy from your tutorial is. But most of all, laugh yourselves silly and have a great time! Prices are $17 for students and $20 for the general public. Tickets will sell fast and it’s our biggest production yet! Make sure you join the Facebook event to keep up to date.